Big Brands and their Word of Mouth Experts insist that the only good word of mouth is free – and you should never compensate bloggers for their time or even hire brand advocates who can create ways your happy customers can spread the word about you. If they can get small businesses to believe that, they will have the world all to themselves because THEY can afford huge budgets for advertising and they are national or international – and you can’t. companies will NOT work for small business. You are NOT Coca-Cola or McDonald’s. so they can promote your company! You can not count on your customers to be effective evangelists because many of them are passive consumers and will not actively share anything – except when they’re really upset – and that is NOT the kind of sharing you want to see! their friends, family and coworkers. So you need a point of contact – your brand advocate – who provides them with easy ways to spread your message to those who will ACT on their recommendations – people they personally know who trust them! company’s biggest fans into brand ambassadors is no exception. The best Social Media Consultants – like Tamar Weinberg @Tamar – are advising even traditional businesses to use Brand Evangelism to create passionate customers. 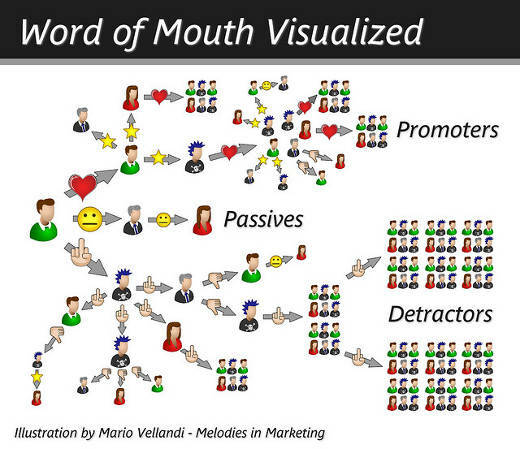 I like this infographic because it is a visual representation of the fact that most people are passive consumers – not promoters. Having a brand advocate continually seeking out the natural born promoters who love your cause, products or services and making it easy for them to rave about you is the least expensive way for a small business to increase visibility and income. and how you can benefit that customer. It is time to stand this whole advertising industry on its ear by becoming brand advocates and spreading the word about what we already love instead of letting only those who can afford to pay agencies for PR and advertising win. Just as I choose to be an influencer of influencers by seeking out the most brilliant social media savvy bloggers to collaborate with, I want to be the evangelist who finds your company’s greatest fans and gets them promoting YOU! Once a collaboration of bloggers exists that fits your location and niche – using my collaboration process – every time any one of those bloggers writes about you ALL of the others share that new content. traditional media uses AP or UPI to syndicate newspaper content. And the best part about this for your non-profit, cause, or ethical small business is that you don’t have to know how to do anything to get this working for you. If your cause, product or service is something that we can believe in, this can work for you. To get a good idea of what kind of people we want to benefit, see my list of the Recommended Brands I whole-heartedly endorse. There is a link to that page at the top of the center column (called a sidebar in blogger jargon) to make it easy to access any time. DISCLAIMER: As of the publication date for this post I am NOT being paid and do NOT have ANY business relationship with ANY of the brands you see on that page. They are companies I believe are doing it right – and I want to promote them. I recommend them and will continue to recommend them whether or not I ever hear from them because they deserve it. more visibility to spread what they do. creating jobs, and raising our collective standard of living. that are active in social media, and reach out to them immediately. For agencies and those small businesses that can afford it there is FINALLY an exceptional solution for searching for the bloggers who fit your needs best and identifying which are the most influential: the GroupHigh Blog Outreach Solution. GroupHigh allows you to search for blogs and bloggers by keywords, blog traffic, Pagerank, and LOCATION. It automatically removes blogs that have not published in six months and you can sort by traffic or Pagerank (and probably others – I’ll be reviewing it soon in more detail). You have GOT to check them out – but, the bad news is their current offerings are priced beyond the range of bloggers and many small businesses. If you can afford though – or have an agency who can – there is nothing else like it. They are the first tool to really make blog outreach research painless. You’ll be hearing much more about them from me very soon. In the meantime, you can find out more about them in Susan Payton’s Small Business Trends review GroupHigh for Researching Bloggers. Is YOUR cause or business one we would passionately promote? Check out my recommended brands and the reasons they’re on there. awesome influential bloggers for you. Just pick up the phone and call, Skype, IM or tweet me any time. See the contact tab for contact details. Did you notice the title? Still wondering what B2I2C marketing is? Business to Influencer to Consumer. Being a business man the best advertising you can have for your enterprise is to give good service and to cater the need of the customer and have them be satisfied. This way they will tell the good service you give to them and may spread it not just to their friends but to almost whole of their clan, you will not just have an advertisement free, you as well gain more customer. I have read your complete article but unable to find the meaning of B2I2C word. Can you please tell me exactly that what is the meaning of B2I2C. Otherwise your article is great. See the very last sentence in the post in red: B2I2C = Business to Influencer to Consumer. Aside from implementing your branding strategies one way of making your company name known in the market is by providing a high quality service and satisfaction to your customers or clients. Once you satisfied their needs, happy customers will surely spread good things about your business. You my not know me but i keep on reading your article regarding WOMM word of mouth, i agree on how effect it is to a potential client. You are such a angel for us beginner in this kind of business. Word of mouth is great especially in business to business sales. If you are operating in a local niche market there’s nothing better than word of mouth to promote your business. I would like to express my gratitude reading on sharing your educational article. It is a great help on my part specially i am just a beginner in this kind of industry. Having evangelists on your side makes all the difference. Getting people to do your marketing is one of the beauties of the online culture. 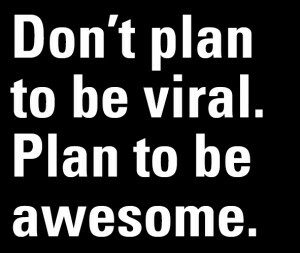 …And being awesome is the way to get that dedicated team. I know this local company which uses the referral system to garner more customers and have a successful business. Indeed, the word of mouth is a very effective way of making your business succeed. minerva would love you to read ..New Website is Now Live! In reality good product is a part of success. The main mission is to raise the awareness of what you are selling and marketing is our friends in this issue. Very new way of thinking. I would look into this more about my new business. No doubt having a good product is by far the most important part of your success especially when the business is solely online. I really think this is taking Social Media to it’s next logical step. It is an awesome idea and will produce stunning results in a super short time. It will put small businesses on the map. Excellent post. Great blog, this is really what people should he read. The new way of thinking outside the box. I agree in most of the topics. Keep doing a great job. Welcome to GrowMap, Shan & Shuja, and thank you. Tools to expand shortened URLs are something everyone can use so I do appreciate you sharing that links with me and my readers. GrowMap is a little different than many blogs. We encourage our commenters to share relevant links in their comments – both in CommentLuv and in the body of the comment. Comments with links MAY go into moderation but we DO approve them – as long as they are related to the post and beneficial to our readers. I hope you’ll be a regular reader and we’ll see you again soon. Word of mouth is a great way to promote online as well as brick and mortar businesses if you provide great products and services and I also like your inforgraph. Great insight. Any cause, non-profit, business or blog can use word of mouth once they figure out what works in their niche and what doesn’t. You should see if you can get an interview with Ana @AnaTrafficCafe because she consistently makes good money with her blog. They key to the word of mouth is that when your product is good, then most definitely word of mouth will just go through faster than you can say travel. Yes, that IS really important – but even those with excellent products have to get visibility started and have social media influencers spread the word or few will ever know how excellent they are! I do understand that not everyone will fit our requirements to become a solutions partner and I do know that our executive team is working on an affiliate program for super-fans to get credit for their evangelism. Until then, please understand that we are still a lean startup that’s slightly boot-strapped.